Integrated Photoelectric Smoke/CO Alarm and LED Strobe Light provides visual and voice warnings. A single unit can be installed that takes the place of two separate smoke and CO alarms where strobe lights were needed. Requires only one electrical box. Low profile bright 177 Candela Strobe Light: light level proven effective in warning those with hearing loss. Dual mode flash patterns for smoke or CO help to differentiate the danger. Synchronized flash rates: strobe flashes will automatically flash at the same time with other interconnected alarms. (Will not synchronize during test mode.) 120V Interconnect with 10 year sealed lithium battery backup. Battery backup provides 10 years of continuous protection. 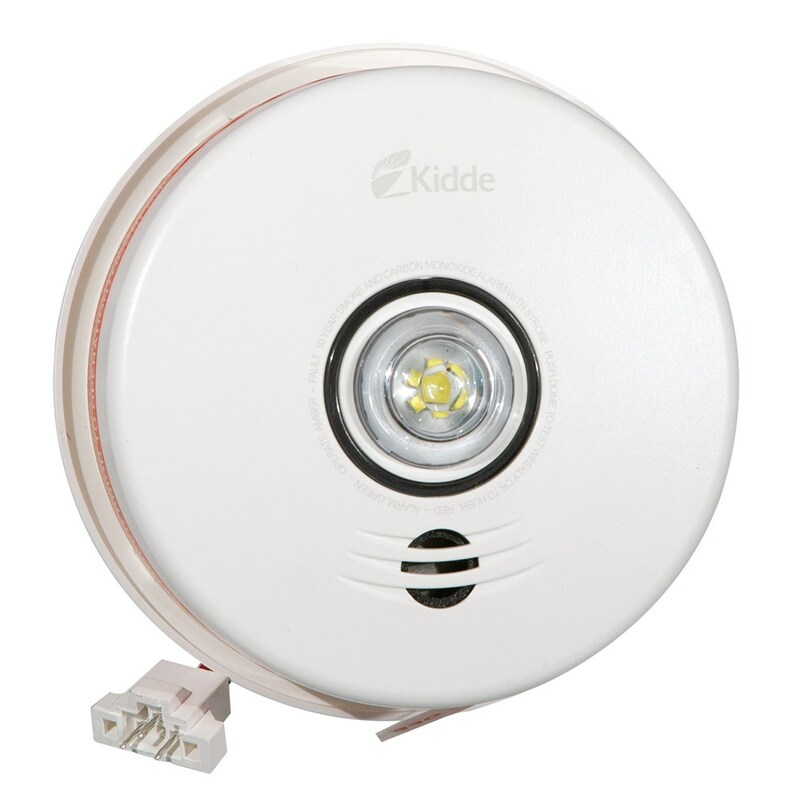 Will interconnect with up to 24 other Kidde devices. Voice warning announces "Fire" or "Carbon Monoxide". Ambient Light Sensing establishes day/night cycle and delays chirping during the night until the next day cycle begins. Multi-function one button strobe dome includes Hush feature temporarily silences nuisance alarms for up to 10 minutes (smoke must be present before Hush is activated). Test feature simultaneously tests the unit's electronics and verifies alarm operation. --Audible alarm 85dB at 10 ft.